SBM Machinery is skilled in supplying manufactured sand screening & washing machine for the operators in the sand making plant to separate the crushed sand. 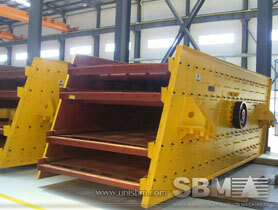 When the sand come out off the sand making machine, it’s goes to vibrating screen. The material drops down along the long line. In screen grading, the material is separated mechanically on screen plates. Overlarge material will go back to sand maker to be refreshed, Output sizes can be made according to customers’ requirement. After that the satisfactory material is transported to sand washing machine, Sand washing machine's electric motor and decelerator drives the impeller in the water groove to move like a circle. Then it mixes, overturns, cleans and discharges the sand or slag pellets in the water groove. Finally the sand or slag pellets are come out of sand washing machine. Then the final sand can be made according to customers’ requirement. For screening, normally acritical process in manufactured sand production, two screens were placed in series with a sieve area of 5m x 2m each. Fro manufactured sand washing, Plant wash crushed fines produced in the quarry, transforming them into concrete sand by using vibratory screens, screw washers, hydrocyclones and dewatering screens. "Manufactured sand screening & washing plant can separate and clean the crushed sand in ten minutes in sand making plant."